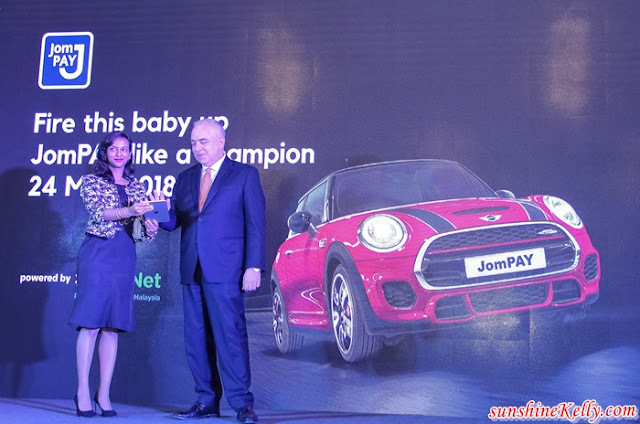 Let’s Fire This Baby Up – JomPAY Like a Champion and Win! Omg… now we all stand a chance to win RM1.7 million in prizes including two limited edition Mini John Cooper Works cars. The contest will run until 30 September 2018. All we need to do is by just saving JomPAY billers as favourites in the Internet Banking of any of the 40 participating banks in Malaysia and subsequently making JomPAY payments using the favourites. The campaign aims to reward online banking users who make JomPAY payments. JomPAY is a convenient, fast and secure way of paying our bills and invoices. We can JomPAY anytime, anywhere through the Internet, Mobile Banking or ATM of their preferred bank. Best of all, JomPAY is free when we make any payments. All you need to do is login your respective Internet Banking, select JomPAY and your Biller as Favourite and then pay to the Favourire Biller; key in the merchant code and under Reference 1 key in your account number. That’s it! Oh i normally pay the bills using jompay as well. I should really make it as favourite. new things/new info for me..memudahkan urusan untuk setelkan segala bil bil secara online.. lagi menarik, the grand prize! - Mini John Cooper Works cars! wowww!!! Wow hadiahnya Mini Cooper. Best ni. Kena daftar untuk Jom Pay la nanti. Selain boleh menang hadiah, ianya senang sebab senarai yang kita selalu membuat pembayaran dah ada dalam Jom Pay. Tiap bulan buka ajer aplikasi Jom Pay ni dan bayar. wow so nice! definitely i will use it! who knows maybe i am one of the winner hehhe . but is it an app on the phone?